While most may question the need for a Nerf Metal Mag/Clip, some of the points & benefits I can understand. I’ve seen normal plastic Nerf mags get stepped on, broken, chipped, have dirt or sand get into them, and even had to use them in the rain myself. The Metal Mag’s 100% Anodized inside should help fight these things, and the Metal Breach and better feeding for blasters will help provide a bit of extra bonus performance. The yellow and gold look fit right into Nerf, and even look a bit cool in my eyes. Having a high quality, durable item like this is exciting, even if it’s not for everyone out there. The thought and design put into these should help progress Nerf as a sport. 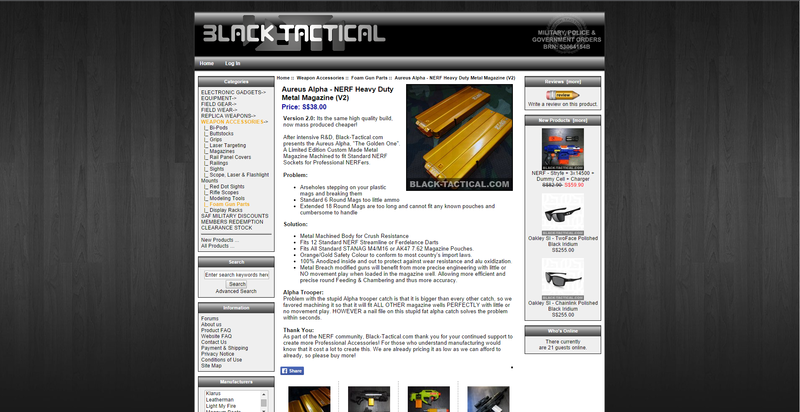 Original Black-Tactical Web Listing Here. You can also view smaller resolution photos of the mags on their site listing.